Update feature can be invoked from the Activities Viewer, how to start it can be found here. Activities viewer prompts you for the activities data file access password on its startup. Enter it or you can simply click the Cancel button (in such a case no activities will be read but we do not need them to access application update feature). Now switch to the ActivityMon tab and click the Check For Updates... button. Dialog will appear and ActivityMon web site will be checked for available updates. If the activation key currently used has the update period expired warning will be shown. 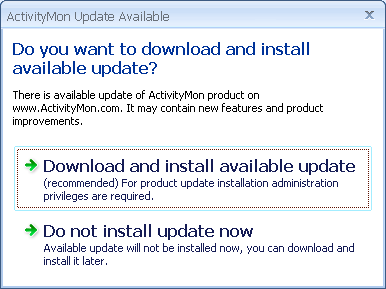 When user will continue with the update installation ActivityMon product will be updated but it will not be activated! If there will be any available ActivityMon update this dialog will be shown to you. In such a case we recommend to download and install available update as it may contain new features or bug fixes. 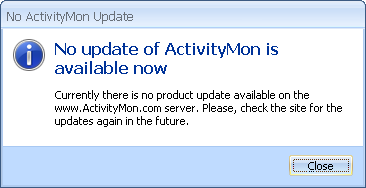 If you are using up-to-date version of ActivityMon and no update is currently available you will see this dialog. Updates are available quite often, we recomend to check for updates twice a month.